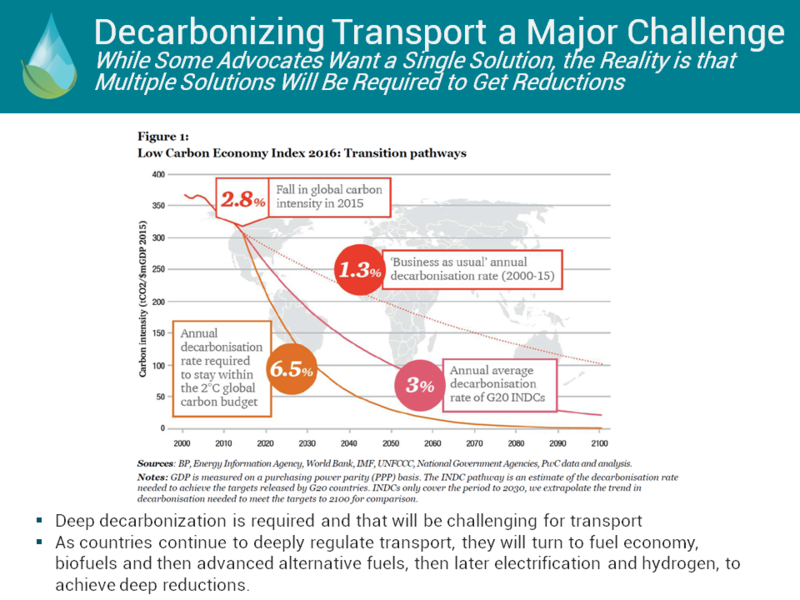 Despite a prolonged period of low crude oil prices, citizens and policymakers in many countries have never been more serious or committed to combating climate change in all sectors, including transport. We know this. The Paris Agreement entered into force in what seemed like a record time – less than a year after it was negotiated. Transport currently contributes 23% of energy-related greenhouse gas (GHG) emissions and 20% of energy use and is expected to double by 2030, according to IEA. Passenger transport accounts for nearly 60% of total transport energy demand, and 60% of this is in OECD member countries right now. GHG emissions are increasing, and so is transport-related air pollution. 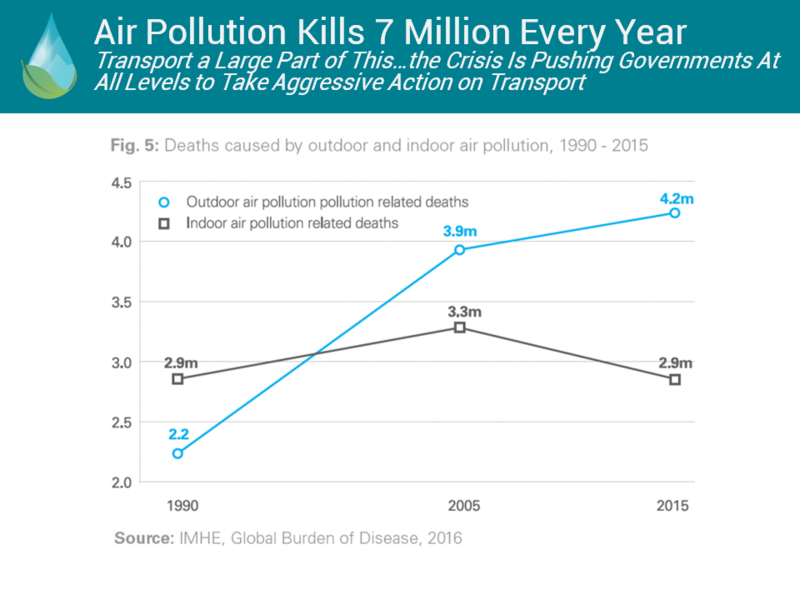 After all the oil and car industries have done to clean up fuels and vehicles over the last 20+ years, air pollution is actually worse than ever in some parts of the world as more and more people with growing incomes buy cars. 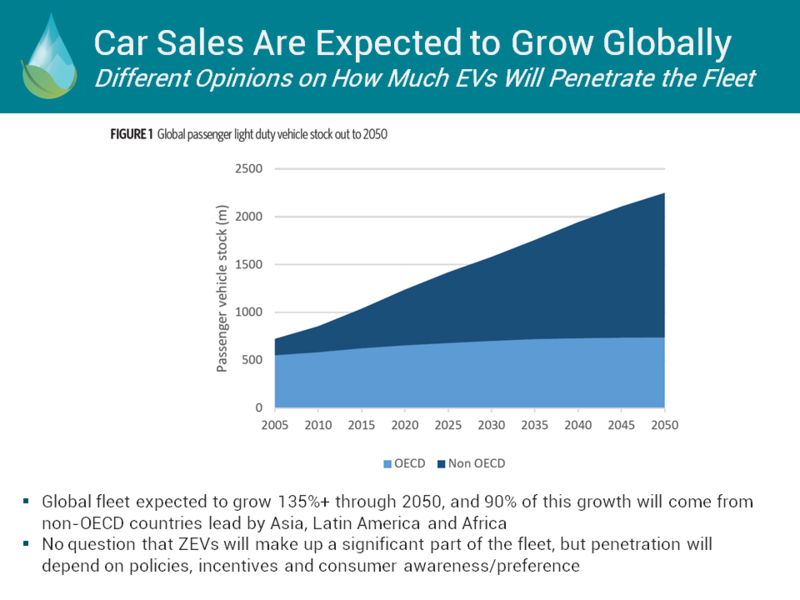 The global car fleet is expected to double in the next 20-25 years, shown in the figure below. And with oil prices so low, people are driving more than ever in countries like China and the U.S.
Air pollution mitigation, except for in extreme cases (like China) has been completely overshadowed by the climate change movement, but the consequences are much more immediate and even alarming as the following chart shows. The problem is so bad that some cities are considering car bans policies, some for the first time. And more are likely to follow. 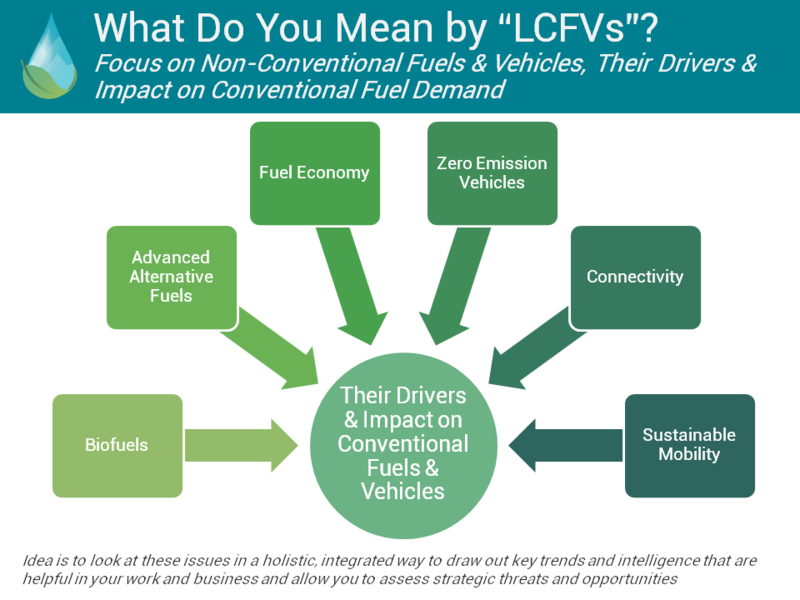 These two main drivers, climate change and air pollution mitigation, is where LCFV initiatives come into play. These kinds of initiatives are targeted to reduce conventional fossil fuel demand and/or the demand for the internal combustion engine primarily in an effort to reduce GHGs and air pollution, but also as a tool toward economic development and energy diversification as well. These initiatives, which I have been covering on my site are shown in the figure below. Countries are now responding with initiatives requiring biofuels blending, electrification, other alternative fuels and tough fuel efficiency standards, among other measures. These measures are linked. 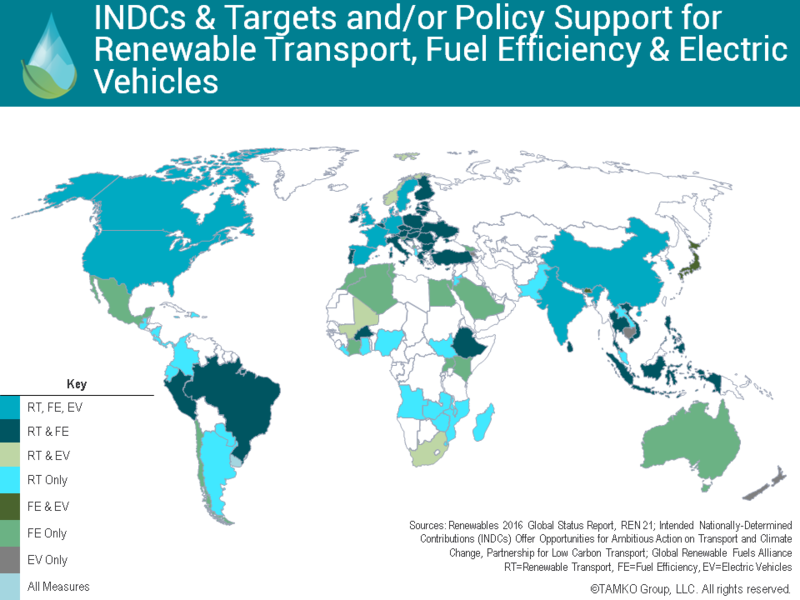 The graphic below shows intended nationally determined contributions (INDCs) for transport countries have submitted as part of their Paris Agreement commitments, as well as a summary of other policy support and measures for renewable transport (e.g. biofuels, advanced biofuels), fuel economy/efficiency and electric vehicles (i.e. zero emission vehicles). My experience is that industries tend to care, appropriately, about what’s happening in their own backyards. For example, if you’re a biofuels producer, you care about things like the Renewable Fuels Standard, Renewable Energy Directive and market share, among myriad other concerns. ZEV initiatives? Maybe not so much? But what motivated me to start my consultancy is that recognition that the stakeholders need to look beyond their backyards and at the bigger picture. It’s looming quickly. You can’t understand the full competitive landscape by only watching what’s happening in your own industry – you need to understand the full landscape to assess both opportunities and threats. And that’s totally overwhelming! Yet, the bigger picture is where we see the convergence of these trends that ultimately affect demand for the all the stakeholders’ products. 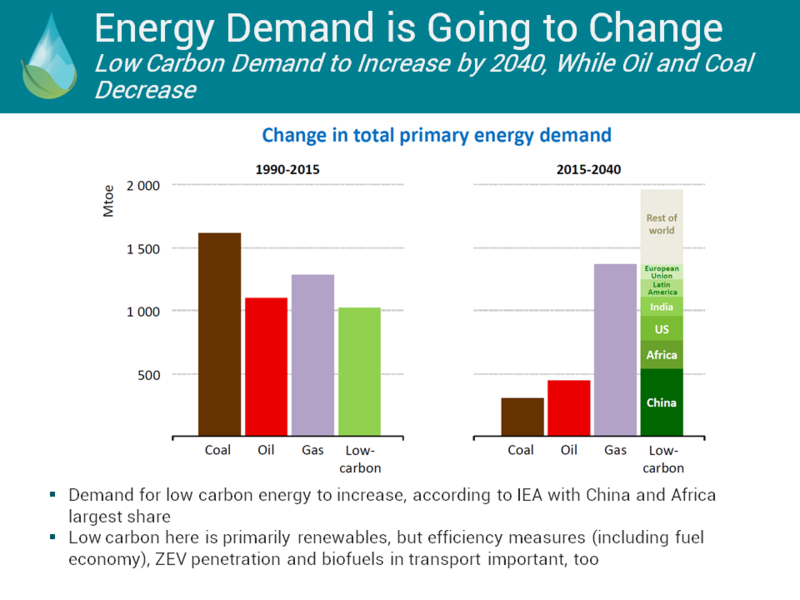 The following graphic showing recent data from IEA on the reduction in oil demand by 2040, makes this very clear. 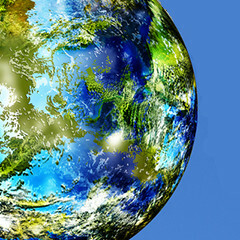 Where are the strategic threats and opportunities in the evolving and emerging carbon-smart economy? They’re both there for all the industries involved. And yes, Trump or no Trump, the march toward a global carbon-smart economy is going to continue whether you agree or not (how it will evolve in the U.S. is yet to be determined). Helping out with the big picture by taking a holistic view that cuts across industries, as well as identifying these strategic threats and opportunities for my clients is what I’m trying to do on a daily basis, and that’s why you find me posting on diverse-seeming topics such as biofuels, fuel economy, zero emission vehicles, oil demand and air pollution mitigation. They all fit together. But understanding how they will fit together, especially in key countries, and what it will mean for the stakeholders in all the affected industries is critical. Thank Tammy for the Post! Delightful to read such a well informed, ambitious, optimistic, professional summary inviting consideration regarding how the world’s 7+ billion citizens might move mass around without suffocating. This old guy is humbled, and happy to be so reassured. Best of luck. Biomass is not a very scalable energy resource: even though we have a lot of it, harvesting it sustainably is a difficult challenge. Fortunately, we don’t need biomass to make sustainable electricity or heat, and it is only needed for sustainable fuels in limited applications: only long distance aviation actually requires the excellent properties of hydrocarbon fuels. At the other extreme, the personal automobile fleet may eventually be predominantly battery powered (which is great for air pollution, since biofuel for cars is roughly as polluting as gasoline or CNG). With the growth in renewable electricity production, it is time to prepare for electric synfuels: those made from sustainable off-peak electricity and a sustainable feedstock (such as water and air). The most practical fuels in this category are the carbon-free fuels, hydrogen and ammonia (NH3). Methane is being tested in some “power-to-fuel” demonstration projects, but this requires a CO2 source (such as a CO2 capture system in a concrete, fossil fuel, or biofuel processing plant), which adds cost when done sustainably. In any case, when we eventually get a carbon tax, even captured CO2 will be affected (unless it is buried). While hydrogen and ammonia can be used in fuel cells (depending on the cell type), ammonia can also be burned in optimized internal combustion engines, at much higher efficiency than gasoline, and with lower pollution emissions than any fuel including hydrogen (ammonia is used for NOx-control in certain exhaust treatment systems for other fuels). While ammonia may not beat batteries for personal cars, it’s a great solution for many applications such as long haul trucks, buses, trains, ships, construction equipment, and off-grid or peaking electrical generators. Ammonia has triple the energy density of 5000 psi hydrogen, and can be stored in thin-walled tanks like propane. This means that unlike hydrogen which basically requires a dedicated pipeline infrastructure for use, ammonia can be economically transported by truck to retailers and end-users. Ammonia sees widespread use today as a fertilizer. It is commonly produced from fossil gas (using about 1% of global production), and much is imported to the US. Rather than using power-to-fuel to make low value fuels like methane, power-to-ammonia makes higher value products like fertilizer and diesel-replacement. I’m symphatic to ammonia, but how about its smell? Won’t that become a huge stumble block? Hydrogen in Germany indicates a different direction. Distributed hydrogen generation at the point where the hydrogen is consumed or to be stored. Car refill stations produce the hydrogen they need in a remote controlled, unmanned plant housed in a standard sea-container. So the car refill station only needs a power line and water. Hydrogen generation at the refueling station is consistent with the old concept of the “fuel cell vehicle as a replacement for BEVs”, which is an idea from the pre-Tesla era. The fuel cell idea is not dead yet, but it seems to be falling far behind BEVs. While this H2 generation method would work well for tropical locations with no seasonal energy supply/demand variations, most of the US has a strong seasonal variation. In order for dispatchable power-to-fuel to be used for seasonal energy balancing, we either need hydrogen pipelines leading from storage sites to retail locations, or ammonia storage which can be anywhere land is cheap and trucks can reach. Regarding the smell of ammonia, it is only somewhat worse than other gaseous fuels (they all must have an odorant added to make leaks noticeable). Because of the greater toxicity, ammonia dispensers will likely be designed for lower user exposure levels than CNG, which should even out the odor levels. Odor is much less important for trucks and commercial equipment, because cost is their big concern. Odor is a disadvantage of gaseous fuels relative to batteries though. Lower reliance on power-to-fuel is an advantage of sustainable energy systems which have a large nuclear component. With 50/50 nuclear and renewables, and all excess generation going to make fuel, I suspect that all produced fuel could be used for diesel replacement, with no need for ammonia personal cars. This is good because synfuel production is effectively subsidized by electricity user, who pay more for electricity so that synfuel plants can have a deep discount (curtailment is the alternative). – Don’t see substantial price diferences at the electricity market between summer and winter here (NL, Germany). And we are here at higher lattitude than USA. – They also have such P2G hydrogen plants at car refuel stations in the north of Germany (Hamburg), so I don’t think seaonal variation is that important. Pipelines for hydrogen transport are not considered. Estimate that those won’t be installed (or only short stretches). It’s easier to place the P2G plant at the place where the earth cavities are for the underground storage. In winter the stored hydrogen can be injected in a natural gas pipeline (everywhere here; max. ~4%) and/or converted to power using a gasturbine. May be in USA, but not here. One of the reasons more and more cities keep diesel trucks and cars out, is the odor coming from their exhaust. When people then also hear that it’s toxic, I estimate it’s the end for ammonia. Here the direction in transportation is towards cleaner, less noise, more user friendly. May be in USA, but not here. Electricity is here a free traded product. So if the price is very low anybody can buy (the reason alu smelters in Germany succesfully compete against those of UK and USA; they only operate when the el. price is vey low). I estimate that such subsidy is against the EU free competition rules. 50% nuclear implies 50% produced by baseload generation, which produce 2-10 times more expensive per KWh than wind & solar. Compared to 100% renewable, nuclear doesn’t change the needed storage amount much. So what’s the added value? Why would anyone, who has a free choice, choose such expensive solution while 100% renewable is much cheaper? – inserts >3GW new heat into the atmosphere for each 1GW power, while wind & solar insert nothing. Biofuels are not low carbon fuels. Most of the energy released upon combustion is attributable to the carbon content. The United Nations Intergovernmental Panel on Climate Change (IPCC) promotes this erroneous view by excluding carbon dioxide from biofuels combustion in country totals of greenhouse gas emissions. In most cases total system carbon dioxide emissions from liquid biofuels probably generates more greenhouse gases than comparable fossil fuels because of the large amount of energy needed to convert biomass into an engine compatible liquid fuels. In addition any large scale the use biofuels impedes the use of land for carbon sequestration because of the need to devote these to energy crops. PS: “Advanced biofuels” systems will probably emit more greenhouse gases because it takes more energy to process these materials and these often contain less energy than the sugars currently used to make ethanol. people are driving more than ever in countries … the U.S. In the US, total VMT has been relatively flat since 2007, and individual ‘people’ are steadily driving less. You’re right Bas, according to Fraunhofer data, the weekly variations in German renewable production swamp the seasonal variations (source). Of course it is still the same problem, for power-to-fuel to help smooth the production peaks, the amount of hydrogen to be stored is far too much to store at retail locations near people: a fuel release accident could destroy a neighborhood (H2 near people is much more dangerous than ammonia stored outside of town). Also, the variation is also too much to level by putting 4% hydrogen into the methane pipeline system, 4% H2 by volume is only about 1% H2 by energy. We need to reduce methane use by 3x or so in the not-do-distant future, so this small option will get even smaller. The subsidy associated with power-to-fuel is not a cash payment, but a willingness to continue adding wind and solar (i.e. increase feed-in tariffs or auction prices or whatever) even though most of their output will be given away at near zero price. The only alternative is to stop the renewable growth and continue burning dirty fossil fuels. Mark, that conclusion doesn’t necessarily follow from your graph. “Per capita VMT” would fall if all drivers drove exactly the same number of miles in 2013 as they did in 1996, but there were proportionally fewer drivers in the US population. The problem arises from the ambiguity of “per capita”, which could refer to either: a) the total population of the US, or b) the total number of drivers in the US. Yes, there is less solar but more wind in winter. Very little chance that the increase of renewable will decline. The new EEG2017 continue with 2.5GW/a targets for onshore wind and solar each (solar FiT’s will increase as too little solar installed in passed 12months). The P2G plants at car refuel stations are not intended to smooth the grid. Their storage capacity is low (for good reasons as you stated). Probably enough to refuel the cars needing fuel for next 24hrs (so to cover a repair period). Which allows for daily smoothing only. – methanize the hydrogen and inject in the gas pipes? As far as I can see ~2030 (>50% renewable) is the earliest date that hydrogen injection in the gas pipes may reach its limits. And the figures may change a lot in coming 15years, as P2G and methanization are still in their infancy. Same for fuel cells, which convert hydrogen to electricity. In germany, grid operators do not see any need for PtG or battery storage unless Wind+Solar contribution exceed 60-80% of power consumption. Up to this point its always more cost efficient touse the electricity directly. The variation of 60-80% depends on the amount of electric vehicles in the fleet, the amount of heat pumps for heating of buildings, and the average relation of building mass and inulation, the strength of the grid and similar factors. …there is less solar but more wind in winter. Yes, generally, but not every week, not every day. Per Nathan’s Fraunhofer graphic, week 4 (in January) has the lowest week of wind generation in 2015. For 2015, German combined solar and wind generation varies over the year by 2:1 on a monthly basis, 7:1 on a weekly basis (week 52:week 4), and 35:1 on a daily basis (day 322: day 20). 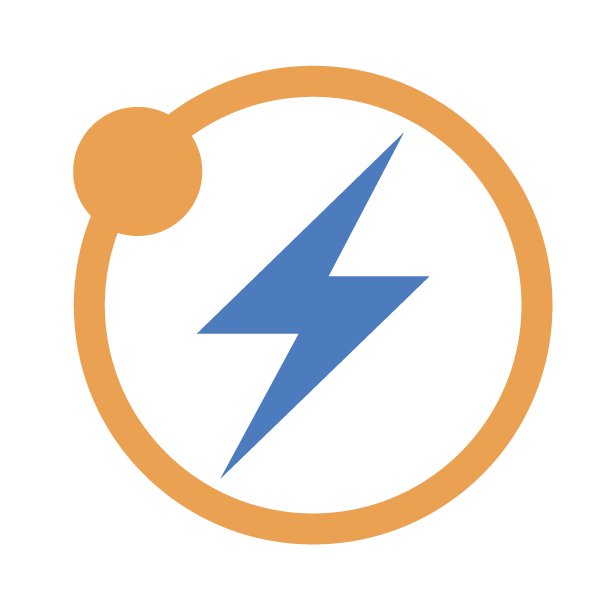 – There is a very successful battery stimulation program for people having <10KW PV-solar on their roof. – P2G is actively supported. dena has a nice overview and states that they target a P2G capacity of 1GW in 2022 on their WEB-site. Agree that my stated 2030 may be too soon. On the other hand you can expect that it will develop gradually during next decades. Does similar also apply for countries in the EU? Is it replaced by more flying? Or more utilization of public transport? More cycling? @ bentvels: Well if you want a technology to be ready to be deployed in 20 years, you have todevelop it now and scale it up to some point. Science and engineering, as well as in software development are not like digging earth, wher you can accelerate things by adding more workers. So it’s neccesary to test things now and give the people time to have good ideas. In 2030 P2G has an active development period of ~20years behind. So I think we agree. Falkenhagen (2MW) started already in 2012. Since then more and more installations with more different technologies. Hard to tell. Suggestions include a decrease in first automobile purchases among youths; the advent of online shopping; better route planning with the aide GPS/online maps; slowed economic growth. ..Increase in telecommuting for work, increased awareness of environmental impact of driving, the rise of Uber & Lyft type services; all are probably having an effect. I imagine that in 10 or 15 years time, a Google or Apple could use big data analytics and all of their users phone tracking data to provide an accurate idea of what is happening. Here you can read the outlines & milestores of dena’s Power-to-Gas plan. dena target to get P2G available as an economically viable, large-scale tested option in the 2020/25 period. Yes, this illustrates why I don’t believe the renewable-based fossil fuel phase-outs will work: the advocates which support it seem determined to make technology choices that can’t possibly work (e.g. your insistence that problems with variability are too far in the future to worry about and Helmut’s insistence that the world will soon be united under a shared friendship grid). Nathan, the power exchange between Lissabon and Wladiwostok exists for many decades….. Some years ago you also didn’t believe that renewable wind & solar could deliver a substantial share. Suggest you base your opinion more on facts and science based predictions, then you won’t be disappointed so much. When did I say renewables could not deliver a substantial share? I’ve quoted the NREL 20% wind vision since 2008. (Perhaps I’ve described 20% wind as too small for adequate decarbonization? Certainly 90+% using nuclear and hydro is better, see France, Sweden, Switzerland, Ontario).